Monument to Bogdan Khmelnitsky in Kiev is a landmark of the history and culture of Ukraine. 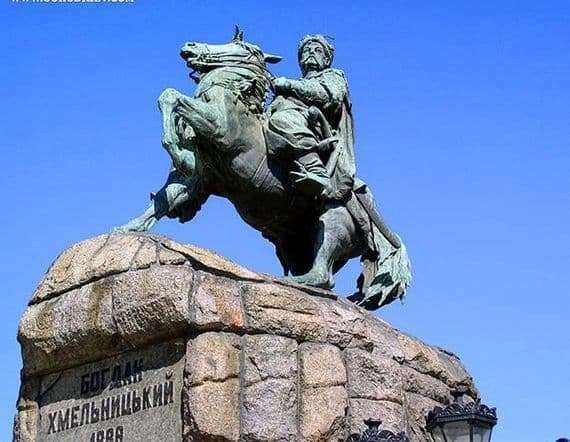 The idea of ​​creating a monument to the famous hetman was first put forward in the thirties of the last century by an outstanding historian, the first rector of Kiev University, Mikhail Maximovitch. Place for the installation of the monument was not chosen by chance. It was on the square against the St. Sophia Cathedral that after the victory near Pylyava and Zborov, the Kievites met their glorious leader. The work on the monument was entrusted to the famous sculptor Mikhail Mikeshin. The artist conceived a multi-figure composition, but the plan was not realized due to lack of funds. The monument has a considerable size. The height of the bronze equestrian statue is more than 10 meters. It is installed on a high granite pedestal imitating unhewn stone. The pedestal under the sculpture was designed by Kiev architect V. Nikolaev. The solemn opening of the monument took place on July 11, 1888 on Sofia Square in honor of the anniversary of the baptism of Russia. The commander is depicted on a horse, which he restrains with a strong and dexterous hand. He confidently holds himself in the saddle, his figure is filled with strength and confidence. The hetman holds the horse halter with his left hand, and the mace is squeezed in his right hand – the symbol of hetman power. The sculptor’s clothes, Bogdan Khmelnitsky, depicted in detail and carefully: Cossack Zhupan, retinue, harem pants. On the side of the Cossack commander gleaming bronze saber. The eye catches the hetman’s face – so sculptor made it expressive. Mikhail Mikeshyn consulted with leading historian Vladimir Antonovich for the accurate presentation of the Khmelnitsky portrait. Deep wrinkles cut the leader’s high forehead. The hetman’s older faces make a long Cossack mustache even stricter. Viewers see the heavy thoughtfulness of the image, fatigue and anxiety in his eyes.